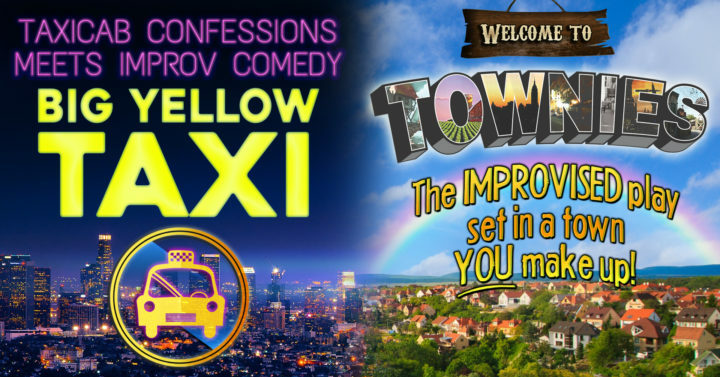 Big Yellow Taxi is the longest running show at the Pack Theater in Los Angeles and features a powerhouse cast of veteran improvisers and Special Guest Drivers each week. Taking the suggestion of a city anywhere in the world, the troupe creates an entire universe of memorable characters inspired by taxi cab “confessions.” The result is a hilarious journey for audiences with unexpected turns and a collision of witty storytelling, theatricality, and schadenfreude. Townies is a fully improvised, one act play that takes place in a fictional town, city, or place suggested by YOU! That’s right! Off an audience member’s suggestion, our team of seasoned improvisers build an entire world on the spot without scripts or direction. It’s a brand new play full of wit and whimsey where unrealized passions, unspoken secrets, and hilarious antics are revealed.